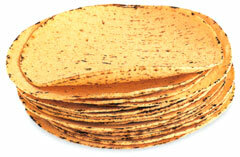 Buy Charras and Los Pericos Mexican Tostadas at MexGrocer.com! Tostadas are like flat tacos that are usually made by layering frijoles (refried beans) on op of a fried, flat corn tortilla and then adding a variety of different toppings, like meat, lettuce, guacamole, cheese and salsa. They're colorful. They're festive. They're easy to make and perfect for a casual spring or summer Mexican dinner buffet. For extra tips on how to decorate your home for a fun and lively Mexican Fiesta, please see the MexCocina archives for "Holiday Appetizer Buffet" from December, 2000 link. Everything you need to know to throw a memorable, authentic fiesta is right there! All recipes below below serve six. Preparation times are as noted. Enjoy! Use this recipe for beef, chicken and turkey tostadas. If you want to make Vegetarian Tostadas, simply make the tostadas and leave out the meat! 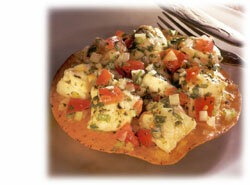 All seafood tostadas are prepared slightly differently, as each recipe indicates. Once you've got your filling done, making the tostadas should only take about 30 minutes, max. �Buen Provecho! In small frying pan, heat oil until a drop of water sizzles immediately when added to it. Fry tortilla lightly on one side. Turn and fry lightly on the other side. Remove from oil and drain on paper towel. Repeat with all 12 tortillas. Heat filling and frijoles until steaming. Place one to two tablespoons of frijoles on top of fried tortilla. Top with another two tablespoons of filling. Add shredded lettuce, onions, tomatoes and guacamole. Top with cheese. Repeat for all tostadas. Serve immediately. And enjoy. There are two ways to make shredded beef. The lightening-fast way uses canned roast beef, while the traditional way takes hours. Whether you're a purist and take the longer pot roast route, or if you're a hurried cook or short-cut seeking camper (like me most of the time) and opt for the quick way-your beef will end up savory, tender and delicious! And no one will ever know if you cheat (unless you confess, of course). This recipe is quick. It takes about 10 minutes! Place rinsed and drained roast beef in medium sized bowl. Add salsa fresca, salt and pepper. Shred the beef while mixing in the other ingredients until it has a stringy texture. Heat in small saucepan on medium low heat until hot. This makes about 1 1/2 cups shredded beef, or enough for eight tacos or tostadas, or four burritos. This recipe takes about five hours to make, but you'll end up with enough shredded beef to freeze and use again, whether it's to make more tostadas, or tacos or burritos. Dredge pot roast in flour. In a Dutch oven, heat oil until sizzling. Brown pot roast on all sides in oil. Remove roast from pot, add onions and cook until translucent. Put roast back in pot. Add water, garlic and all other ingredients. Stir well. Bring to boil. Cover and reduce heat. Simmer for at least four hours, until meat is fork tender. Remove from heat and cool until you are able to comfortably handle meat. Place meat on cutting board and using two forks, shred the beef. Return meat to pan and stir with all spices. You have enough shredded beef for two dozen tacos or tostadas, or about fifteen to eighteen burritos. Any unused meat can be frozen for future use. Use this filling in any of the taco, tostada or burrito recipes. It's a lean, lighter way to fill your tortillas, but I guarantee you, you won't be sacrificing any flavor! If you use fresh chicken breasts, it will take you about an hour to make the filling. If you use canned chicken, it will take about 10 minutes. Bake chicken breasts in oven for 30 minutes at 350 degrees. Remove from oven and cool. Using two forks, shred the chicken. If you are using canned chicken, drain off excess liquid, place in bowl and shred. In a medium sized bowl, mix shredded chicken with salsa and garlic. Add salt and pepper to taste. Serve as suggested above in "How to Make Tostadas." Use this filling in any of the taco, tostada or burrito recipes. It's lean and light, yet delicious. Thanks to the cumin you'll never taste anything that compares to this turkey filling. It's delectable! This recipe takes about an hour. Bake turkey in oven for 30 minutes at 350 degrees. Remove from oven and cool. Using two forks, shred the turkey. In a medium sized bowl, mix shredded turkey with salsa, garlic, cumin, Pico Pica sauce, salt and pepper. Serve as suggested above in "How to Make Tostadas." This recipe is a variation on the famous Baja Fish Taco. If you don't want to use fried fish, you can lightly season and broil or grill the fish filets instead. You won't sacrifice either the taste or the inherent air of festivity generated by these colorful, incredible tostadas. This recipe takes about an hour to make. Dredge each fish filet in beaten egg. Coat thoroughly with mixture of corn flake crumbs and Italian bread crumbs. In a frying pan heat oil until a drop of water sizzles when put in the pan. Cook each fish filet for three to four minutes on each side. Remove from pan and drain on paper towels. Place filets in oven on warm until you are ready to serve. In a small bowl, mix the sour cream sauce and Pico Pica with the radishes. Put a fish filet on fried, flat tortilla. Place one to two tablespoons of sauce on top of filet as you are serving it. Garnish with shredded cabbage, cilantro, tomato, cheese and serve immediately with salsa fresca on the side. Lobster tacos and tostadas originated at Mama Diaz' restaurant in Bah�a de Los Angeles. (Bay of L.A., as we gringos call it, is a remote but spectacularly scenic fishing village on the Sea of Cortez, a third of the way down the Baja peninsula.) The first time I had them was over thirty years ago, before there was even a paved road south of El Rosario (barely the other side of Ensenada). They're still just as good! Once the lobster is cooked, this recipe takes about 20 minutes. Heat lobster, garlic, chiles and lime juice in medium sized saucepan. Serve as you would any tacos with a variety of condiments. In a small bowl, mix the sour cream sauce and Pico Pica with the radishes. Put a scoop of lobster mixture on fried, flat tortilla. Place one to two tablespoons of sauce on top of meat as you are serving it. Garnish with shredded cabbage, cilantro, tomato, cheese and serve immediately with salsa fresca on the side. At the very tip of Baja, just offshore from Cabo San Lucas, is what's called Finisterra, or Land's End. There is an exquisite beach that you can reach only by boat, whether it be panga, yacht, kayak or jet ski. It's a two-sided spit of sand called Lover's Beach and it gets pretty windy out there because one side of it faces the Pacific and the other the Sea of Cortez. Just past it is the world-famous, frequently-photographed, dramatic rock formations known as Los Arcos. These rocks rise ruggedly above an undersea cascade of rocks and sand, which was discovered and explored by Jacques Cousteau a couple of decades back. While Cabo San Lucas was visited by the missionaries as far back as the 1500s, and it was a favored hang out for pirates and whaling vessels in the 180's, it really didn't take off as a town until the late 1960s. With the completion of Mexico's Highway 1, which runs down the entire length of the Baja peninsula in 1974, Cabo finally began to grow. The first time I vacationed there in the early '80s it was a sleepy village with absolutely zero nightlife. These days it's a bustling tourist metropolis that's home to both Planet Hollywood and the Hard Rock Cafe. Any night of the week you can hear young (and not-so-young) American tourists boogying the night away, hooting and hollering in any of the many bars and nightclubs all over town. The ceviche takes 11/2 to 2 hours to make. Once it's done, the tostadas take another 20 minutes. Ceviche originated in places where seafood was plentiful but refrigeration rare. Ceviche is usually served as an appetizer, but is wonderful in these tostadas as well. It's delicious, low in calories and has become popular all over California, Baja and mainland Mexico because of its subtle but spicy taste. In a large bowl combine all ingredients except l/2 the avocado and cilantro. Toss gently but thoroughly, making sure all fish is coated with lemon-lime mixture. Cover and refrigerate for one to three hours, stirring occasionally. Fish should become quite white and scallops will lose translucent appearance. (Once this happens, you will know that the lemon juice has "cooked" them and they are quite okay to eat.) Just prior to serving, add avocado and top with remaining cilantro. Spoon the chilled ceviche directly onto fried flat tortillas. Top with listed toppings and serve immediately.